Inspired by the spicy humor of Cajun Night Before Christmas® and the authors’ own chaotic holiday experiences, this is the story of St. Nick, an alligator named Pierre, and the Boudreau family’s post-Christmas blues. Boudreau needs to get away. His children are hollering as they play with their new toys, and his wife has cleaned out their pocketbook after buying Christmas gifts and treats. As he drifts down the bayou on a moonlit night, Boudreau spies Pierre, one of St. Nicholas’ alligators that has been left behind! Boudreau offers Pierre a home to keep him safe from hunters and trappers. Will St. Nick ever come back for his lost gator? And what will Boudreau’s children think of this new pet? The antics of this cast of characters are sure to induce laughter and add a fun twist to the original story! Sisters and visual artists Jenny Jackson Moss and Amy Jackson Dixon grew up in Louisiana and attended Tulane University’s Newcomb College in New Orleans. Moss lives in South Carolina with her husband and three children, and Dixon lives in Colorado with her husband and three children. 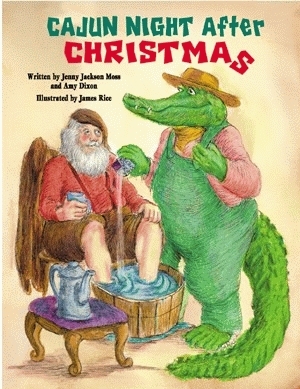 James Rice (1934-2004), in his long, distinguished career as an author and illustrator, produced more than sixty children’s books, among them several additions to The Night Before Christmas Series. 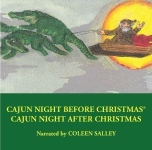 Cajun Night Before Christmas®, Rice’s first book, has been nationally recognized as a classic in its genre. Rice taught art and music at both high school and college levels and loved teaching children the joys of writing and illustrating. With more than 2.5 million copies of his books in print, Rice ranks among the nation’s best-selling creators of children’s books, having received awards from Printer Industries of America and the Children’s Book Council.